Overseas Filipino Workers (OFWs) are not rich despite being able to earn higher salary abroad. There are times that they need to reach out to someone for their financial needs. When they need to have their own house or pay their mortgage, they could use a loan to do it but finding the most accommodating bank or government entity to avail it might be difficult for them. Being based overseas also limits their means and even capabilities to meet their needs with the various financial institutions in the Philippines. 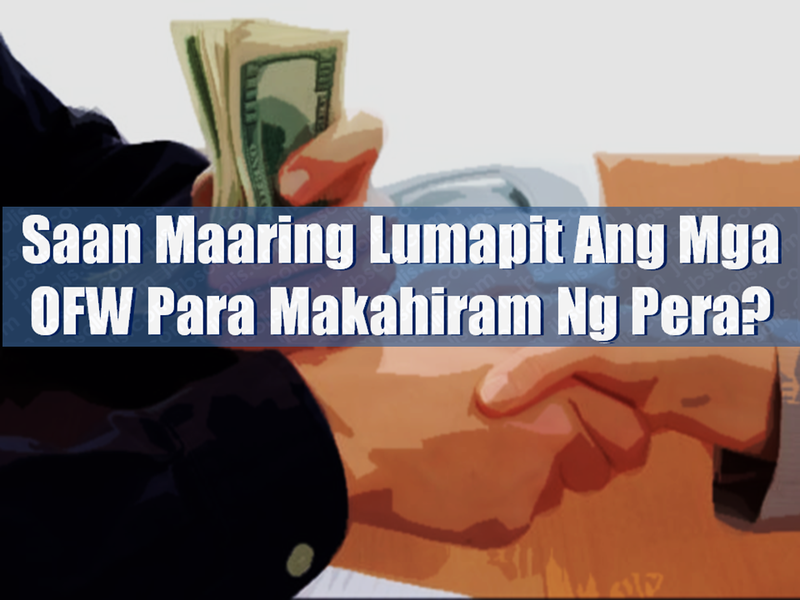 The OFWs has buying power with over $24.35 billion worth of remittances has been sent to the Philippines last year. In this regard, local lenders have been more than willing to accommodate OFWs who are looking to loan cash. BDO offers Personal, Home, and Auto Loans to OFWs through its Asenso Kabayan Program. Borrowers should at least be 25 years old but not more than 65 years old upon the maturity of the loan. You should be employed for at least 2 years abroad for skilled workers, and at least 3 years for domestic helpers taking home at minimum P10,000 gross monthly for Personal and Home Loans, and P50,000 per month for Auto Loan. Borrowers can submit their application to callcenter@bdo.com.ph. You must also have an initial minimum deposit of P100 for peso account and $100 for dollar account to qualify for the loans. All forms can be downloaded at www.bdo.com.ph. BPI grants Personal Loan, Housing Loan and Auto Loans to OFWs working abroad for at least 2 years and earning a minimum of P30,000 per month for Personal and Auto Loans, and a minimum of P40,000 for Housing Loans. Borrowers should be at least 21 years old and not more than 60 years old upon the maturity of the loan. You must be physically present at the BPI branch to sign the loan documents once it is approved. To apply online, visit www.bpiloans.com. OFWs employed for at least 3 years and earning a minimum of P50,000 per month can apply for a Housing Loan at Chinabank. You must be at least 21 years old and not older 65 years old upon loan maturity, without any adverse credit findings such as court cases, bouncing checks, unpaid loans, cancelled credit cards, etc. For more information, check out www.chinabank.ph. EastWest Bank offers Home and Auto loans to OFWs between 21 years old and up to 65 years old upon loan maturity, who earns a minimum of P40,000 monthly income. You can fill out the application form at www.eastwestbanker.com and submit necessary documents to csloans@eastwestbanker.com. Land Bank offers home loans to OFWs through its Bahay Para sa Bagong Bayani Program. Borrowers holding a live contract from a reputable company, 21 years old but not more than 65 years old upon loan maturity, and without any CI/BI adverse findings are qualified to apply for the loan. Interested applicants can visit www.landbank.com for more information. PNB offers home loans for OFWs based in Singapore, Japan, New York and Los Angeles, through its Own a Philippine Home Loan program. Borrowers based in Singapore must have a minimum gross annual salary of SGD 48,000 and your Total Debt Servicing Ratio must not exceed 60% of Gross Monthly Income. Meanwhile, OFWs based in Hong Kong and Saudi Arabia can avail of PNB’s Global Filipino Auto Loan program. You should be at least 21 years old and not more than 60 years old upon loan maturity to qualify. PNB also requires interested borrowers to have worked abroad for the last 2 years. You can visit www.pnb.com.ph for more details. Security Bank offers housing and auto loans to OFWs who have worked abroad for at least 2 years and are least 21 years old, but not more than 65 years old upon loan maturity. Borrowers must be earning a combined household income of at least P50,000 for housing loans; a minimum monthly income of P40,000 for brand-new car buyers; P20,000 for pre-owned car buyers. Interested borrowers must complete the necessary documents and scan them. Fill out the online application form at www.securitybank.com and upload the documents. OFWs working for at least 2 years in a permanent capacity can apply for a housing loan at RCBC. Borrowers have to be at least 21 years old upon application but not more than 65 years old upon loan maturity. You can visit www.rcbcsavings.com for more information. OFWs employed for the last 12 months with a minimum gross monthly income of P30,000 can apply for a home loan at UCPB. Visit www.ucpb.com to learn more. OFWs who have remitted at least 24 monthly contributions can qualify to avail of Pag-IBIG’s affordable housing loan. New members may, may alternately pay the 24 monthly contributions in lump sum. Borrowers must be below 65 years old, without any outstanding Pag-IBIG housing loan nor multi-purpose loan in arrears. As an additional requirement, you should not have had a Pag-IBIG housing loan that was foreclosed, cancelled, bought back due to default or subjected to Dacion en Pago. For more information, visit www.pagibigfund.gov.ph. Certified OFWs who have at least 36 monthly contribution and 24 continuous contributions can apply for a Direct Housing Loan Facility for OFWs offered by SSS. To qualify, borrowers must not have a previously granted SSS housing loan, or receiving final SSS benefits. The spouse of an existing borrower may still qualify for an SSS housing loan if the loan had been obtained before their marriage and the loan isn’t delinquent. You can visit www.sss.gov.ph for more information.